From festivals to carnivals and shows, there's plenty to do this weekend in southwestern Connecticut. Head to the annual Saint Mary School Carnival in Bethel this Friday, Saturday and Sunday. Find out more. "Woman in Gold," starring Helen Mirren and Ryan Reynolds, will be playing at the Ridgefield Playhouse eon Friday, Saturday and Sunday. Find out more. Comedian Whitney Cummings will perform at the Ridgefield Playhouse on Friday. Find out more. Former American Idol-winner, Kris Allen, will perform at Mohegan Sun on Friday. Find out more. Comedian Jo Koy will perform at Foxwoods on Friday. Find out more. Head to Foxwoods on Friday to see "Real Housewives of new Jersey" star Melissa Gorga at the Belvedere Ball. Find out more. The Bridgeport Bluefish are hitting the field on Friday, Saturday and Sunday. Find out more. Hoodoo Brown BBQ opens for dinner in Ridgefield on Friday. Find out more. Watch "American Sniper" for just $2.00 at Newtown's Edmond Town Hall on Friday, Saturday or Sunday. Find out more. The Wolf Pack battle the Hershey Bears in Game 6 of the second round of the Calder Cup Playoffs this Friday at the XL Center in Hartford. Find out more. The 19th International Children’s Art Exhibit opens this Friday at the Maritime Aquarium in Norwalk. Find out more. The Saturday Movie Matinee at the Bridgeport Library is "The Homesman." Find out more. "Mad Max: Fury Road" opens in theaters this weekend. Watch the trailer. Bllues musician Ana Popovic will perform at StageOne in Fairfield on Saturday. Find out more. ﻿Shelley Regner, from left, Kelley Alice Jakle, Hailee Steinfeld, Anna Kendrick, Brittany Snow, Alexis Knapp and Rebel Wilson star in "Pitch Perfect 2" opening this weekend. Watch the trailer. 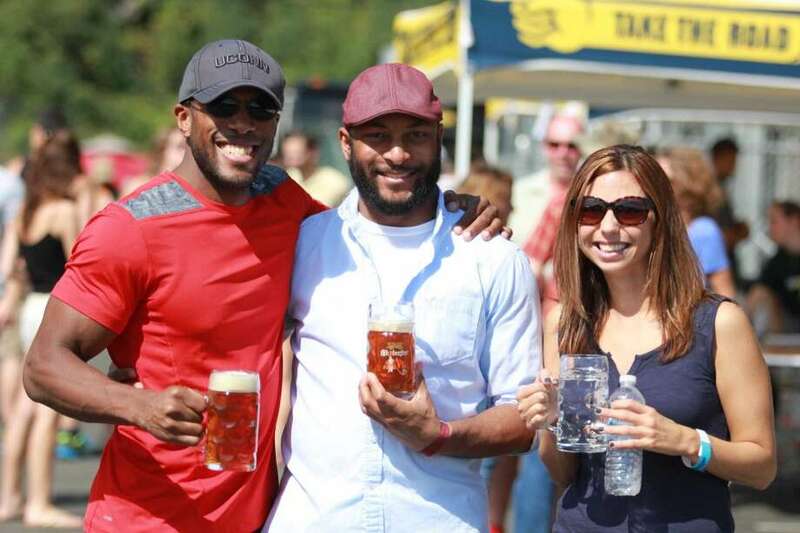 The Brews & BBQ Festival, put on by America On Tap, is this Saturday at the Ives Concert Park in Danbury. Find out more. The Westport Arts Center's gala "Midnight in the Garden of Good and Evil" is this Saturday. Guests will enjoy drinks and music amongst art and sculptures created by local landscape designers and artists. Find out more. Stamford schools are holding STEMfest at Mill River Park on Saturday with a range of activities and displays centering Science, Technology, Engineering and Math for students and their parents. Find out more. ReVisit Bridgeport will feature photographs by Ed Brinsko and highlights the images that were the high points of Brinsko’s career. This photography collection is a treasure trove of images that are important to Bridgeport’s history. The event takes place Saturday at the Bridgeport Public Library. Find out more. The hit Broadway musical "Matilda," based on a Roald Dahl story, uses a male actor to play the vicious larger-than-life educator Miss Trunchbull. The show's national tour is starting in New Haven Saturday. Find out more. The Stamford Museum and Nature Center's annual Spring on the Farm Festival is this Saturday and Sunday. Find out more. The Wilton Historical Society is planning a free Barn Raising Day on Saturday on its property. Featured will be re-enactor Jennifer Lee who will portray an Algonkian woman from about 1750. Find out more. Cranbury Park in Norwalk will serve as the site for the Connecticut Tree Festival on Saturday. This free event is intended for residents looking to find out more about caring for the trees on their property. There will be other activities, too, including a number for children. Find out more. American cellist Allison Eldredge will join the Norwalk Symphony at Norwalk Concert Hall on Saturday for its final concert in its 75th anniversary season. Find out more. Massachusetts appraiser Tom Tomaszek will be featured at the Grace Antiques Appraisal Day & Flea Market Saturday in Stratford. Find out more. "The Queen of Mean" Lisa Lampanelli, a Trumbull native, comes to Bridgeport for a comedy benefit gala for the Housatonic Museum of Art on Saturday. Find out more. William Sadler (pictured) is one of several celebrities who will attend a Ridgefield Playhouse film screening on Saturday to raise money for Healing the Children Northeast. Find out more. The Danbury Music Centre will host “Salute to Sinatra,” a benefit performance of the Danbury Music Centre Big Band on Saturday in Marian Anderson Recital Hall at the Danbury Music Centre. Find out more. The Ridgefield Symphony Orchestra season will culminate this Saturday with Beethoven’s Ninth, complete with an 80-person chorus and four soloists, plus Shubert’s Rosamunde Ballet Music to open the show. Find out more. The Jamie Oliver Food Revolution returns to New Canaan on Saturday, once again getting kids and parents excited about food. Families can visit participating New Canaan restaurants and stores to taste samples and get a stamp in their passport. Find out more. The Tribuna newspaper will host the American Dream Awards on Saturday at the Portuguese Cultural Center in Danbury to honor community members for their contributions toward building bridges between cultures. Find out more. This Saturday, the Milford Police Department and the Milford Recreation Department will host a Bike Rodeo at Harborside Middle School. Find out more. Bethel is celebrating Memorial Day early with a parade and service this Sunday. Find out more. The Sunday Film Festival at the Bridgeport Library will feature "Still Alice" this week. Find out more. This 30th Annual Outdoor Crafts Festival at the Bruce Museum in Greenwich opens is this Saturday and Sunday. Artists will be discussing their work , having craft demonstration with live music as a backdrop. Find out more. The Julliard String Quartet will perform Sunday at the Pequot Library in Southport, a concert sponsored by the Westport Arts Center. Find out more. May is National Bike Month. Here's where you can ride. A new musical about the lives of twenty-somethings, "The Theory of Relativity," will show at Goodspeed Musicals' Norma Terris Theatre in Chester through May 31. Find out more.